PHILIP ZINMAN was born July 18, 1904 to Robert and Esther Zinman. His early years were spent in Philadelphia PA , where his father had a cigar store at 4001 York Road. He made his way to Camden in the 1920s, where he would have a long and successful career in real estate, becoming a nationally known figure in his field, as evidenced in his being cited in the 1983 edition of Who's Who in Real Estate, and in several editions of Standard & Poor's Register of Corporations, Directors and Executives. In the 1920s he served as secretary on the Camden County Real Estate Board, and later was president of the Mortgage Bankers Association of New Jersey. Philip Zinman was partnered in a real estate firm with Benjamin Stambler in the late 1920s, with offices in the Wilson Building at Broadway and Cooper Street. By 1936 he was on his own, and did business out of 333 Arch Street. He would later move to 519 Market Street, where his agency, with exception of a brief period around 1959, would remain into the late 1970s. Philip Zinman was quite active in Jewish affairs both ;locally and internationally. In 1984 he was one of the first eight people to have granted an honorary doctorate from the University of Haifa, in Haifa, Israel. Two other Americans were so honored that year, one of them being Dr. Henry Kissinger. He established the Philip and Betty Zinman Endowment for Jewish Cultural Arts at the University of Pennsylvania , which, since 1992, has sponsored the Teatron Jewish Theatre. The Philip Zinman Foundation also funds the Philip Zinman Foundation International Studies Honors Scholarship at the Florida Atlantic University. This scholarship was established by Betty Zinman of the Philip Zinman Foundation in January 2002, and is intended for students enrolled in the Harriet L. Wilkes Honors College with an interest in international studies. Philip Zinman was included in the 1980 Who's Who in American Jewry, and the 1972 and 1978 editions of Who's Who in World Jewry. By 1947 Philip Zinman was living at 5325 Browning Road in Pennsauken NJ with his wife Zola. She passed away in 1981. He eventually retired to Boca Raton FL where he resided when he passed way on February 5, 1993. The Zinman name is still alive in South Jersey, as the Battista-Zinman Agency still serves the area from its offices at 5801 Westfield avenue in Pennsauken NJ. Crashing through the ice while skating, Philip Zinman, secretary or the Camden County Real Estate Board, narrowly escaped death it was learned yesterday. Zinman had left his office in the Wilson Building shortly after noon Tuesday to go to the park. He had been told that the ice was thick, and it was an ideal day for skating. The realty board secretary anticipated an hour’s sport as he adjusted his skates at the park. Soon he was cutting fancy figures on the ice as he swirled along the frozen surface, the only skater on the lake. Suddenly, the ice cracked under his feet and he dropped into the hole that had opened under his weight. Zinman shouted for help as he returned to the surface. No one was near. He called again, and saw two school children. But they did not hear him. Zinman, after his harrowing experience, for a hot mustard foot bath and a change of dry clothes. A Boy Scout who saved a man from drowning under the ice of Farnham Park at the risk of his own life will receive public commendation for his act of heroism from Secretary of Labor James J. Davis when the latter visits this city Thursday. 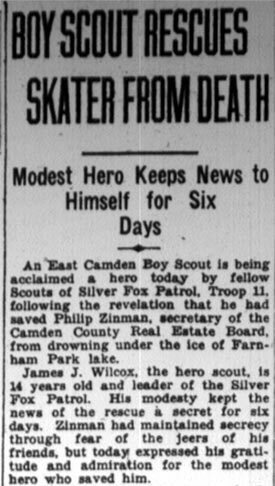 This announcement was made today by Philip Zinman, prominent Camden business man and secretary of the Real Estate Board who was pulled from the water of Farnham Park by James J. Wilcox, 14-year old Scout leader of the Silver Fox Patrol Troop 11, of East Camden, when he broke through the ice while skating last Tuesday. Paralyzed by the frigid water and exhausted by his desperate efforts to save himself, Zinman was rescued by the lad, who, with the help of the branch of a tree, dragged him to safety. of honor at the banquet of the real Estate Board in the Hotel Walt Whitman. Wilcox will receive praise and congratulations from Secretary Davis who will visit this city and address the board. A desire to express his gratitude to he boy for saving his life prompted Philip Zinman to ask the member of the President’s Cabinet to personally commend the lad. The accident happened when Zinman skated too near the statue at the north end of the lake and was catapulted into deep water when an entire section of iced collapsed beneath his weight. 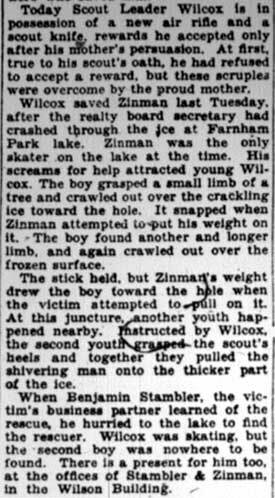 As piece after piece of the ice snapped, Zinman shouted for help and young Wilcox heard him. The boy grasped the branch of a tree and crawled out over the cracking ice towards the hole. It snapped when Zinman tries to put his weight on it. The boy found another and longer limb and again crawled out over the ice. The stick held and with the aid of another boy whose name could not be learned, Zinman was pulled to safety. H.H. Etter, a scout official, said that he will recommend Wilcox for a gold medal, one of the highest honors that can be awarded a Boy Scout. A new boom in real estate values within the next several months was forecast yesterday by Philip Zinman, Camden real estate man who spoke at the weekly meeting of the Camden Lions Club in Hotel Walt Whitman. "President Roosevelt's Inflation program is responsible for the slow but sure comeback of real estate," Zinman said. "Real estate, unlike stocks and other commodities. did not suffer such heavy losses when the last boom ended and depression set in. That is one reason why its recovery will probably be more quickly than other things. "Within the last six-to eight weeks business of rentals of property has picked up tremendously. It will continue for with more people going back to work, it, means more rent and the payment of back debts. "Another factor will be that many empty houses will shortly be occupied. Three out of every four tenants of houses in Camden and vicinity have somebody else living with them at the present time. However it won't be for long for the great American desire is to live in your own home," Zinman added.